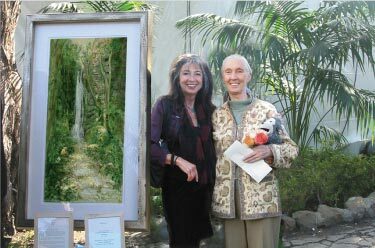 A celebrity auction benefiting the Jane Goodall Institute featured the artwork of Minneapolis/California based artist Joan Solomon. 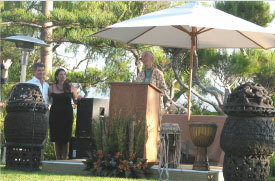 The event hosted by Pierce and Keeley Brosnan, was held on the bluffs overlooking the Pacific Ocean in Malibu, California. African dancers and music provided the backdrop. Luminaries from film, television and music, including David Caruso, Natalie Cole, Brendan Fraser, Hugh Grant and Greg Kinnear participated in the festivities and celebrated the life work of Dr. Goodall with a silent auction and book signing. The Spirit of Gombe Painting, created by Joan Solomon, with guidance by Dr. Goodall from a continent away, was unveiled at this event. It was the signature painting and featured auction piece. Stationary and prints based on the art and designed by Joan Solomon were included in the gift bags and are now available, along with a commemorative poster, at www.janegoodall.org.Proceeds from the sale of these items benefit Dr. Goodall’s work and programs for the chimps and the environment. 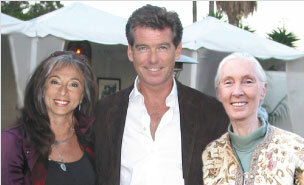 Dr.Goodall expressed a personal connection to the work after meeting the artist. She wondered if Joan Solomon could capture the sense of awe, experienced at a sacred falls in Gombe, Tanzania – a lush ravine and waterfall, where Dr. Goodall has spent many hours observing her beloved chimps. 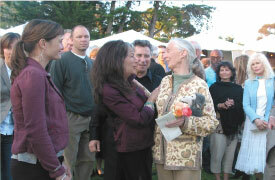 At Dr. Goodall’s request, the Jane Goodall Institute sent the artist a photograph. Upon initial examination, it showed little detail, but on closer inspection, the face of a chimp in the rocks revealed itself. This unique message from Nature provided Joan Solomon with the inspiration she needed to start working. During the months of intensive painting, Joan wrote to Dr. Goodall, detailing her emotions. “I felt such elation, such awe immediately followed by enormous, engulfing anguish. I could see the story unfolding, how the animals, the forest and the people are eternally interwoven.” A large print of the image traveled across continents, through the jungle and was presented by JGI board member, Billy Weisman on the shores of Lake Tanganyika, in Tanzania, where benefactors of the Institute had gathered. The artist retains all rights of reproduction and copyright to all pieces.